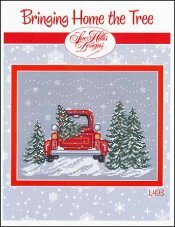 Bringing Home The Tree [C5906] - $10.00 : Yarn Tree, Your wholesale source for cross stitch supplies. Cross stitch pattern by Sue Hillis Designs. Stitch count 127 x 96.